Ok, apply your own claim on explanation WHY homogenous infinite plane doesn't change attraction on object with object's distance from the plane. Also, WHY is gravity force inside shell zero? Show yourself HOW is that explained. Let an object located inside the spherical shell. The acceleration due to gravity “g” of an object is much greater (say 1000 times) than the “g” of a spherical shell. The radius of the object is much smaller than the radius of shprical shell. An object may be solid sphere, semi-solid spherical shell etc - What would you think about the aforesaid? Is it derived by Newton? An object starts losing "g2" while gaining g1 as it goes down till g1 = g2 or both g1 and g2 turn into full “ge” at the center of earth. I know you wouldn’t agree with this but IMPOV this is true as the effect of g1 is missing in derivation. The spherical shell is easy. Inside g = 0 and outside g =GM/R^2. Not at all easy, each has to be down by a complicated integration process. Often this is done numerically. But any mass of only 1 kg has infinitesimal gravitation. On the surface of a sphere of the size you give it would be about 2.67 x 1010 N/kg (or m/s2). Put small object in the center of big ball (or cube). Left half of the ball will pull the small object to the left, right half will pull the object to the right. Halves have same masses and inflict equal forces, each in own direction. Forces of those halves will act on the same object, in opposite directions, and cancel each other. Let an object located inside the spherical shell. The acceleration due to gravity “g” of an object is much greater (say 1000 times) than the “g” of a spherical shell. The radius of the object is much smaller than the radius of spherical shell. An object may be solid sphere, semi-solid spherical shell etc - What would you think about the aforesaid? You didn't say it, but physics did, and you say you follow laws of physics. Inside homogenous hollow sphere acceleration g and gravitational force F is zero. All sides of the hollow sphere pull in every direction and resultant is zero. Imperfections or deformations of sphere will change balance and resultant will pull toward places with higher thickness or density. Thinner or less dense parts will reduce that pull, but not completely. The acceleration g (1000 times greater) you mention will work outside of the sphere, and be smaller and smaller as you go away from it. Now, about that infinite plane. It will pull small object towards it. It will pull two objects towards two different spots, directly below each of them. But unlike spheres, infinite plane gives constant g at all altitudes. So, where is the center of mass of infinite plane? How can you apply "F = GMm/d2" ? Which d will you use? As you can see, you don't use resultant as you would when objects are t some distance from each other. You will use integral function that sums vectors of gravitational forces of individual parts of the plane. Smaller the parts you choose, more of them you have, more accurate you calculate. Laws of physics are tools. Our mathematical explanations of nature, and ways to predict behavior, or to plan actions in order to get desired result. As every other tool, you have to know how and where you can use it. It is hard to tighten 12 mm nut with 9 mm wrench. Imagine a small solid sphere “A” located inside a very large hollow sphere “B” but their centers don’t coincide. The gravitational acceleration “g” of “A” is much greater than “g” of “B”. You seem to sum all the individual forces and make the resultant zero but ignore their accelerations due to gravities. I asked a question about gravity at the center of earth but you said: “it would make internal part of the mass zero” by limiting the value of R to zero in g=GM/R^2. Gravity at the center of earth with a radius of R is not equal to zero. This is the center of gravity of earth or this is the center where gravity of whole mass of earth appears to act. I think that a lot of your confusion is trying to assign g's to every object. In my opinion the idea of assigning a gravitational acceleration to an object is useful only for massive objects like the earth or the moon. There is no gravitational field inside the "very large hollow sphere B" due to B. So there is no force on A or B. No, the accelerations are due to the forces. One way to calculate "g" is to calculate the gravitational force on a test mass of 1 Kg. In fact, while "g" is usually written in units of acceleration, m/s2, but equivalent and often better units are force per unit mass or N/kg. There are no separate "accelerations due to gravities". The acceleration of each object is simply dye to the one force acting on each object. As I and others have said, there is no gravitational field inside a spherical shell, due to that shell. This is true for any thickness shell. So at the centre of the earth, at a radius of zero, there can be no mass inside. No, I'm afraid that "Gravity at the center of earth with a radius of R is" equal to zero. The whole mass of a sphere appears to act at the centre, only for points outside the sphere. For points inside the sphere, at radius r from the centre, the gravitational force is only that due to the mass inside radius r .
And that is what everybody else here and all the freeness say. Inside solid hollow homogenous sphere resultant g is zero, not because G is zero. G is always 6.67408 x 10 -11, hence the name Gravitational CONSTANT. It is mathematical factor used in formulas. Our own tools. Reason why g = 0 inside is because opposite sides of hollow sphere cancel each other's influence on the particle inside. One pull one way, other pull the opposite. Derived formula you are trying to use came from integral function of individual pull from parts of body. It is just a resultant and you have to know where and when you can use it with satisfactory accuracy. It works outside the sphere. When the object is inside, one side of sphere is pullin in one direction and other side is pulling in other direction. Newton gave proof of that. Go to THIS ARTICLE, and scroll down to "Newton's Proofs". There's a part named "Force on a Point Inside a Hollow Sphere". Particle inside the sphere is pulled by mass distributed in sphere walls, not by empty spot S in the middle of the sphere. Outside, the whole pull acts toward one side. Resultant would be toward S and we can use F = GMm / d2. Inside the pull is toward everywhere. All around. The formula doesn't work here. If particle P is closer to one side of wall it is by another side pulled weaker because of distance, but harder because from same angle is pulled by more mass. There's more mass from K to L than from I to H.
Those two factors perfectly balance one another and resultant is equal to pull from closer part of the sphere with less mass. Pull towards J is equal and opposite to pull towards M, and in all other directions situation is similar. And all of that acts on the same particle P.
Force by the Earth on apple is pulling apple, not Earth. Force by the apple on Earth is puling Earth, not apple in that opposite direction. Earth is pulling one object, apple is pulling another object. Forces on two different objects don't cancel each other. It only means that one object pulling another will not remain indifferent by pull by that other object back. Similar thing you also have in magnetic fields. One magnet pulling another will not stay in place. They will both "jump" to each other. Only, heavier magnet will jump less. That is why, if you pull me with some rope, you have to support yourself with your leg to stay where you are. If you don't, you'll also get pulled to central point between us. 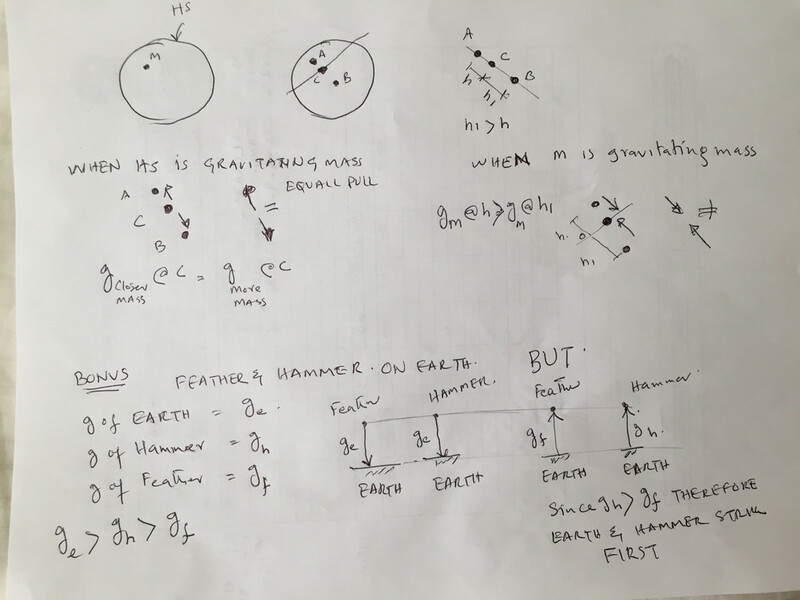 Most physicists agreed that gravities do not cancel each other even if it does then again you are making “g” zero at the center of particle P inside the HS and hence G = 0 at the center of particles. Similarly, the weight of the imaginary earth on our real earth is also = 0; Two equal and opposite pulls so total pull is zero. Mass closer to one side of the wall of HS: it depends upon the “g” of M and "g" of the mass of HS closer to the M. We know “g” increases with a decrease in distance. No, as has been presented numerous times and with proof. "Inside solid hollow homogenous sphere resultant g" due to the HS is zero everywhere. Since the “g” of HS inside the HS is everywhere zero, obviously the only case is “g” of HS < M.
There is no question at all the total pull is zero. Where did you drag this up from, "Most physicists agreed that gravities do not cancel each other even if it does then again you are making “g” zero at the center of particle P inside the HS and hence G = 0 at the center of particles. Similarly, the weight of the imaginary earth on our real earth is also = 0; Two equal and opposite pulls so total pull is zero." No physicist would have made a statement like that. Gravitation has both magnitude and direction (a vector) so, what you call "gravities" most certainly can cancel. That is how there is no gravity inside a hollow sphere, due to that sphere. Mass on one side is closer, but there is more mass on another side. If you don't understand English, try to pretend that you understand Hindi. It might seem strange, but I'm sure you will understand this guy very well. I don't speak Hindi, but I see what is he talking about. "Resultant g is zero" everywhere inside a "hollow homogenous sphere (HS) in the absence of mass both inside and outside". For application of the law of gravity inside a uniform spherical shell of mass M, a point is chosen on the axis of a circular strip of mass. The problem is envisioned as dividing an infinitesemally thin spherical shell of density σ per unit area into circular strips of infinitesemal width. The choice of such a point involves no loss of generality because for any point inside the shell, the mass elements could be chosen so that the point is on their symmetry axis. You could also look at: Wikipedia, Shell theorem or Quora.com Why is gravity inside a spherical shell considered to be zero? No! That is completely untrue. Gravitation has direction and so the gravitation from two object's can cancel. even if it does then again you are making “g” zero at the center of particle P inside the HS and hence G = 0 at the center of particles. Similarly, the weight of the imaginary earth on our real earth is also = 0; Two equal and opposite pulls so total pull is zero. The bit you are ignoring is that the closer part is smaller in area than the farther part by exactly the correct ratio for their gravitational forces to be equal and opposite. Look, go and read the references that hopefully explain it better than I. - This is one way where is particle pull? That makes you closer to understanding why resultant "g" is zero inside homogenous hollow sphere. Center of mass of one side is closer to inner particle, but mass of that side is smaller. Center of mass of other side is farther from inner particle, but mass of that part is bigger. Pull between the particle and one side in one direction becomes equal to pull between the particle and other side in opposite direction. It is quite easy to derive the gravitational field intensity at a point within a hollow sphere. However, the result is quite surprising. The field intensity at any point within a hollow sphere is zero. You still need to do a bit of geometric math, but you can show that the area of each red bit is proportional to the square of the distance from you (the blue point) to it--and hence the mass of each bit is also proportional to the square of the distance, since we assume the shell has uniform density. But gravity obeys an inverse-square law, so each of those two bits should exert the same gravitational pull on you, but in opposite directions, meaning the two bits exert zero net force on you. And you can vary the axis along which the two cones are drawn so that every point on the surface of the shell ends up being part of a pair like this, which leads to the conclusion that the entire spherical shell exerts zero net force on you. But, if you can't, or won't do the maths yourself and won't believe the references from those that can, I don't know how to explain it any further. Acceleration due to gravity of earth; ge = GM/R^2 (on the the surface of earth); where R = radius of earth. An apple falls due to ge on Earth. The earth also moves upwards towards apple due to ga of apple but by such a minuscule amount to be noticed or measured. Newton’s gravitational force is between two masses. Gravitational force on a mass is only considered during split analyses like “Earth on apple” and “Apple on earth”. Their combined effect appears in F = GMm/d^2. As gravitational force is a force that attracts any objects with mass therefore HS attracts M but M also attracts HS. The miscalculation in shell theorem is that HS attracts M but M doesn’t attract HS. Would you now calculate how long it would take a hammer of mass 1 kg and a feather of mass 0.05 g to fall 10 m in a perfect vacuum? Pigeon Tail Feather: 50 mg. If you have any concept of relative values you might get the message. PS: Whatever you claim Newton's Shell Theorem is correct and the gravity inside a spherical shell, due to that shell is zero. And if they were being dropped from the same location at the same time, their combined mass would act on the earth so they would still hit the earth simultaneously. EEK thinks he has discovered something noteworthy but it is in fact extraordinarily insignificant. But no, "The idea of experiments is" not "to eliminate the variables", but to find the magnitude of their effects. Maybe that does eliminate the variable, but it might also simply mean that effect of the variable is too small for that experimental method to resolve. Exactly that happened to the early proposals for the heliocentric solar system. Aristarchus of Samos proposed it, but it was rejected because it was reasoned, correctly, that the annual motion of the sun should cause stellar parallax. As no stellar parallax could be observed, heliocentrism was rejected. Again, Copernicus proposed heliocentrism, but it was rejected, at least by Tycho Brahe because even with his far more accurate measurements he still observed no stellar parallax. But this stellar parallax was finally observed and was far smaller than Tycho Brahe could have ever measured without a telescope. The largest stellar parallax of only of 0.772-arcsec is for Proxima Centauri. One reason for doing such calculations is to get some idea of what precision is required in the experiment. Of course neither Aristarchus of Samos nor Tycho Brahe could have made these calculations, but for these fall times, we can. Possibly a simple manual drop an a stop-watch would be adequate. Then maybe a sophisticated electronically controlled drop mechanism coupled to a high precision electronic timer might be needed. So, maybe you could calculate those times and let's know what equipment might be needed to measure the times. Inside HS, g is due only to the earth. HS contributes nothing. Outside HS, g is due to the mass of the earth, Me, plus the mass of HS, mHS, all centred at the common centre. Your ">>>>>>>>" is unnecessary, provided the geometries are perfect the result applies to any masses. I hope this is close enough to what you were asking.